When & Where: The parade will kick-off at 12pm on Saturday, April 23 at the corner of Congress and Annie Street and end at Jo’s Coffee on 1300 South Congress. 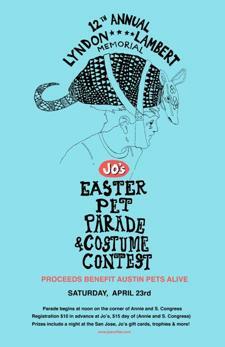 What: Bring your finest pet costume, the judging will begin promptly after the parade and top awards for the best dressed pets include a night at the Hotel San Jose, Jo’s gift cards, trophies, and more! How: Pets can be preregistered at Jo’s Coffee on South Congress. Registration is $10 in advance and $15 the day of the parade. Registration starts April 4 forms will be available online at Jo's Coffee online or at Jo’s Coffee on South Congress. 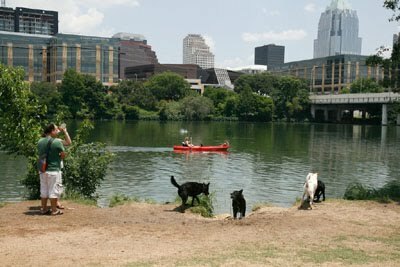 Who: Benefits Austin Pets Alive! Thanks for providing this video. This was a great watch and everyone enjoyed it.